A lot of times I will walk into the kitchen and find mine surrounded by craft items. Pipe cleaners, glue sticks, colored paper bits, and pom-poms will be scattered about as they design a house for their miniature animals or maybe a mask they plan to use for play. Open-ended craft time like that is important. But my kids also love it when I suggest a kids craft. So when my daughter found the coffee filters and started coloring them, I knew it was the perfect time to make some more coffee filter suncatchers. She adored this tulip craft, and I know your kids will, too! 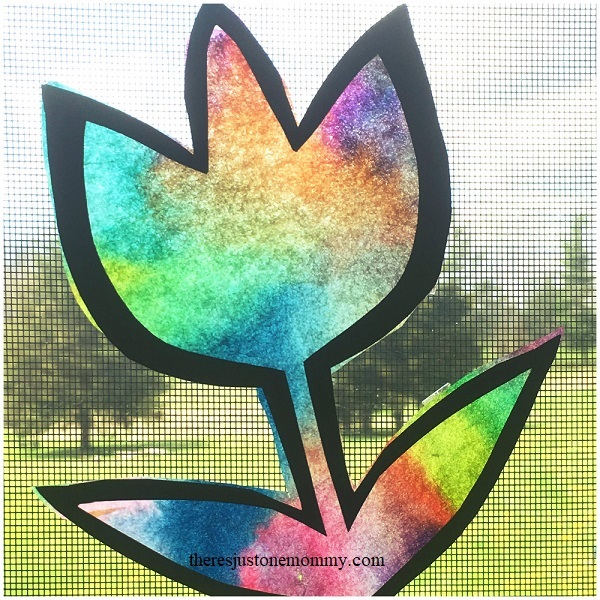 This simple craft has become one of our favorite spring rainbow crafts. 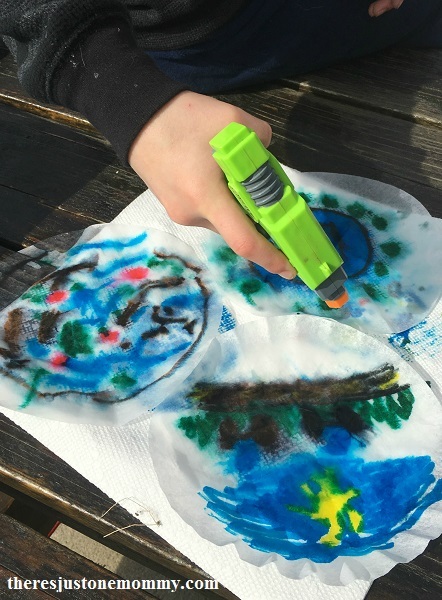 Use your washable markers to color your coffee filter. Wide markers work best. For the best results you want to have color on almost the whole filter. Once the filter is completely colored, place it on several paper towels. The paper towels will reduce the mess. Use the squirt bottle to spray the filter. (My son loves this one that looks like a squirt gun.) Almost immediately you will see the colors start to spread. Once each coffee filter has been sprayed, allow them to dry completely. 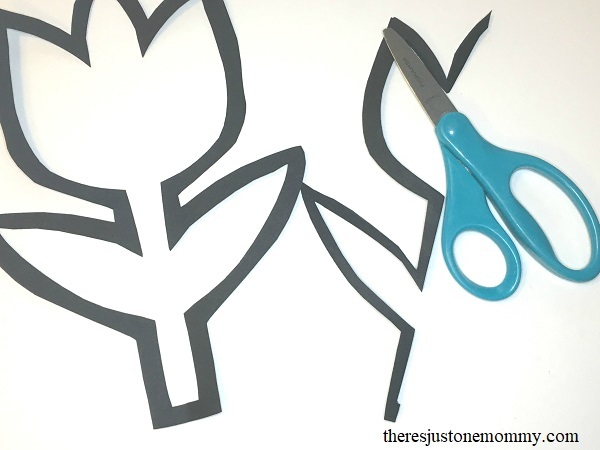 To make the frame for the tulip craft, fold a piece of black construction paper in half. Cut the shape of half a tulip from the paper. Be sure your flower shape isn’t bigger than the coffee filters you used! Then cut the same shape out again, leaving 1/4 inch or so of paper around the edge. When you unfold the paper you have the outline of a tulip. 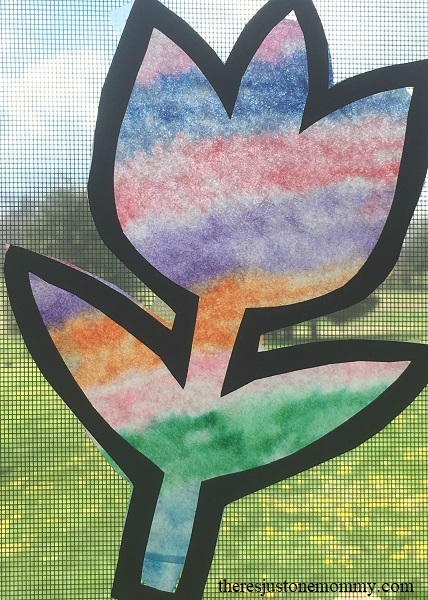 Once the coffee filters are dry, use very small pieces of double-sided tape to stick them to your paper tulip shapes. We tried using glue sticks to do this, but we found the tape worked better. Use scissors to carefully trip off the excess coffee filter from your tulip craft. Then hang them in a sunny window to enjoy. I think my favorite is this tie-dyed coffee filter suncatcher. I love the bright splotches of color and how they mix together. 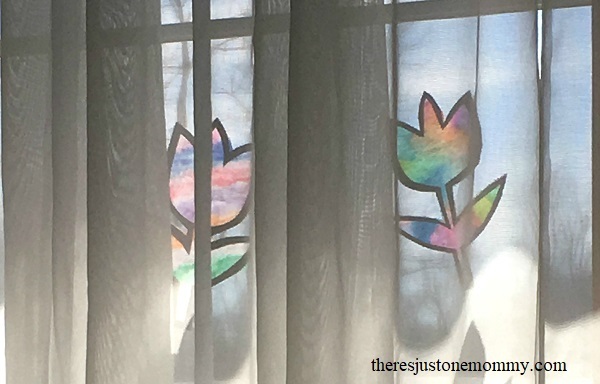 These colorful coffee filter suncatchers look beautiful hanging in the windows, which is why this tulip craft is one of our favorite kids spring crafts so far. I just love the blogs like this. I have 2 kids, son, and a daughter and they are 3 and 5 years old. So, they are naughty when they are bored. So, I just need blogs like this. I don’t have to buy them a new toy and I just love to make things. Thank you very much for sharing this with us.